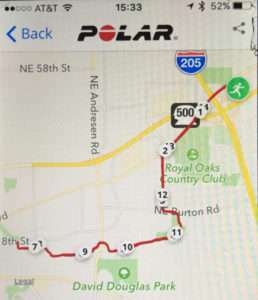 I’ve been training for the Portland Marathon with the Polar Heart Rate Monitor for the last 7 weeks. For the last 6 years, I have been using the Garmin 110 Forerunner. 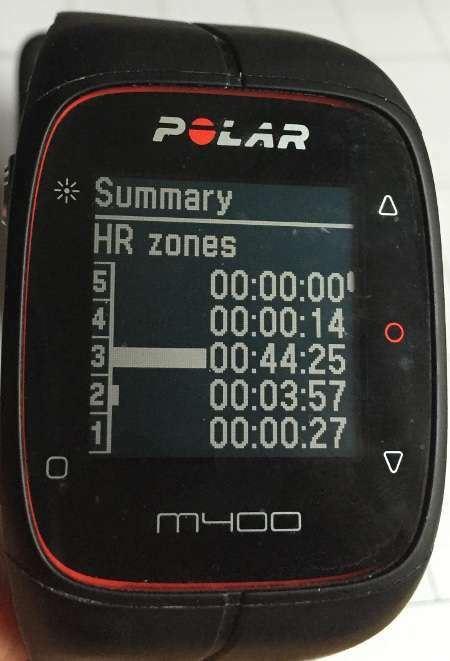 In this article, I will discuss the features of the M400 that I have put to test, how they have significantly improved my training and why I’m switching to the M400 from Garmin. The 110 is Garmin’s older base model. It’s a good watch and has served me well with basic distance and time tracking of my runs. I’ve also used Garmin’s heart rate sensor and monitor features, but I often have challenges syncing the watch and the heart rate sensor. I started testing my M400 at the beginning of August. It was a little challenging to set-up and sync with the (Polar Flow) iPhone app, but by following the directions very carefully, I was able to load all my personal information (age, weight, running goals, etc) and complete the set-up so I could take advantage of the benefits of the watch and Polar Flow (the online 24/7 activity, training and sleep tracking web service that is also an app for iPhone and Andriod). Downloading the app allows Bluetooth sync between the M400 and your mobile phone. Not only can I see workout details on my phone, but now I can see incoming texts and alerts on my watch (similar to the Apple Watch). Once the set-up was complete and I started to use the watch, l felt like I had moved into the “21st Century” from the “Dark Ages” compared to what I was used to with my Garmin 110. I’m very impressed with the technology that Polar packs into this watch. It’s easy to instantly sync workouts to Polar Flow via Bluetooth to my iPhone. This allows me to instantly see all the details of my workouts. Following are a couple of screen shots of my watch and the Polar Flow iPhone app with workout details. As you can see, basics of the workout are covered. I didn’t wear my heart rate sensor with this particular workout. 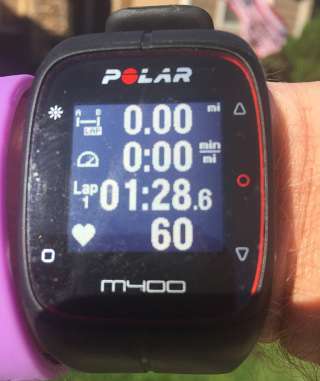 Although I have not had the time to use all the features offered with the M400 GPS watch, I can assure you that this watch does far more than simply track your pace and distance. It tracks steps, daily calories burned and your sleep at night. The watch is very smart. In fact, it knows when it isn’t being worn, when you are sitting, standing, walking, jogging or resting. When coupled with a heart rate sensor, the M400 is a heart rate monitor. 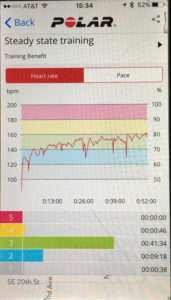 I really like this feature, I not only use heart rate zones during my training, but I rely on my heart rate monitor during the later stages of marathon training to keep me from overtraining. One of the signs of overtraining is an inability to elevate your heart rate even though you may feel tired and unable to run much faster. 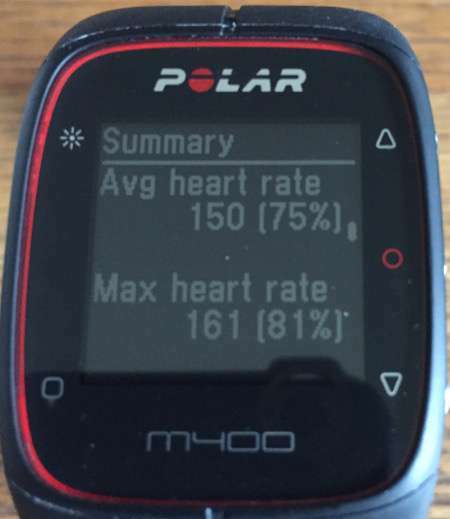 Although, there are many other signs of overtraining, this is the one I use where a heart rate monitor is essential. 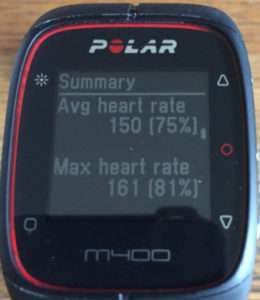 The M400 shows your heart rate in big bold easy to read numbers. The watch can also verify which heart rate zone you’re in at any time during your run. The benefit is that it provides a more accurate account of your effort level. 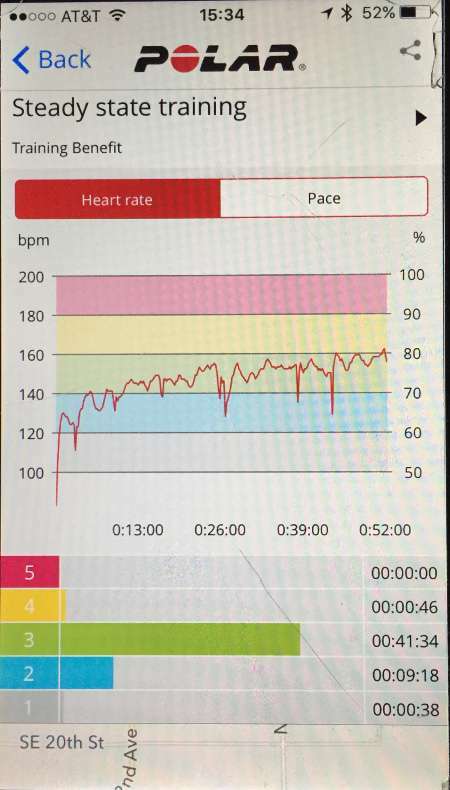 In my article about training with a heart rate monitor, I discuss these zones and how you can incorporate zone training into your workouts (3-5 are the most common zones that I run in). 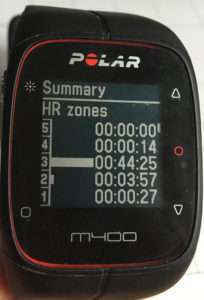 You can get additional in depth information about Running heart rate zones by visiting the Polar Website. Understanding your running cadence (steps per minute) and increasing it if necessary, can help you improve your running efficiency. If you’re overstriding (low cadence) you may be at increased risk of injury. Measuring your cadence is easy with the Polar watch and increasing accordingly, can reduce muscle damage caused by overstriding. Your height, weight, leg and stride length and running ability will determine your optimal cadence. Everyday runners generally fall between 160-170 steps per minute. 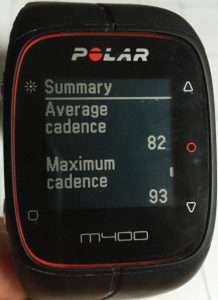 With the M400, just multiply the average cadence shown on the watch by 2. Instead of using an awkward clip with wire/pin connectors like Garmin, the M400 has a small rubber flap on the back of the watch that covers a micro USB port. I used to have problems with my clip making a connection, so charging through this port is a great feature. The micro USB port and M400 watch is waterproof (up to 30 meters). This is perfect if you’re training for or running in a triathlon so you can swim with your watch on. Overall, I found that the buttons are easy to press and large enough to engage while running or other types of exercise. On the right side, the up, enter, and down buttons help you scroll through features such as your diary of activity, personal settings and even a fitness test. On the left, there are the light and back buttons. Managing the M400 with these buttons does not take long to figure out. 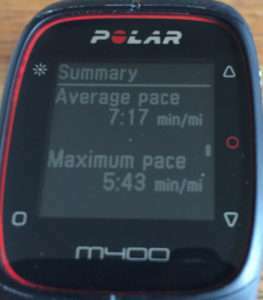 The Polar M400 gives you a considerable amount of information during and after you have completed your run. 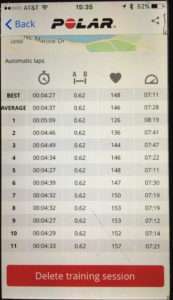 Below you can see the details of my heart rate and the amount of time I was running in a particular heart rate zone. 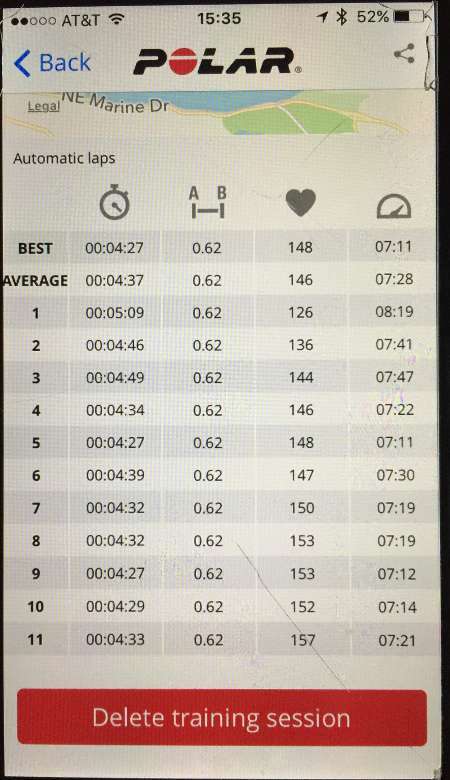 You can view the start time, duration, distance, calories burned, fat burn percentage of calories, average pace, max pace, max altitude, ascent, descent, auto lap times, best lap time and average lap time. 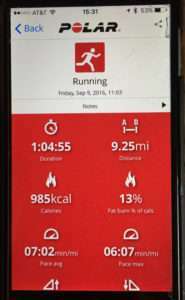 It will also keep track of your personal records and will notify you after you complete your longest and fastest runs. The M400 can store up to 30 hours of past runs on its internal storage. All of this information can also be uploaded to Polar’s website. I really like how it’s easy to access details of previous workouts right on my watch. Following images show the workouts for a particular week that have been tracked. As you can see, I can easily scroll to any day and then click on it to view workout details. I like the M400’s battery life. I run and use the GPS daily, but I found that the M400 goes 3-4 days before requiring a recharge. 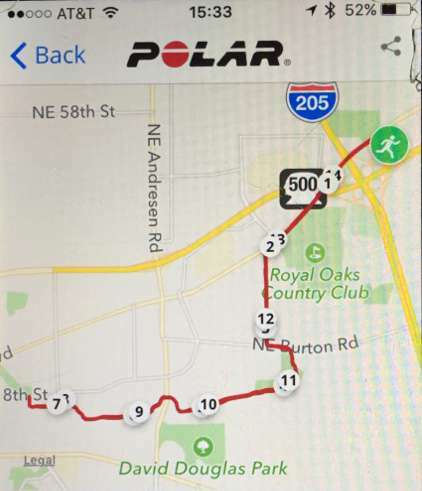 If you’re not using the GPS, Polar claims up to 10 days before a recharge is required. I found that my watch required juice the more often that I used the GPS. 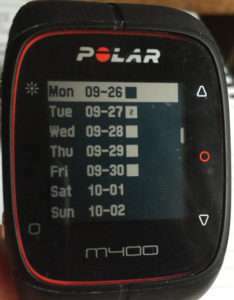 Overall, the big selling point of the Polar M400 is that it’s not just a GPS enabled watch for running, but that it can be used to track other outdoor activities, like cycling and hiking. 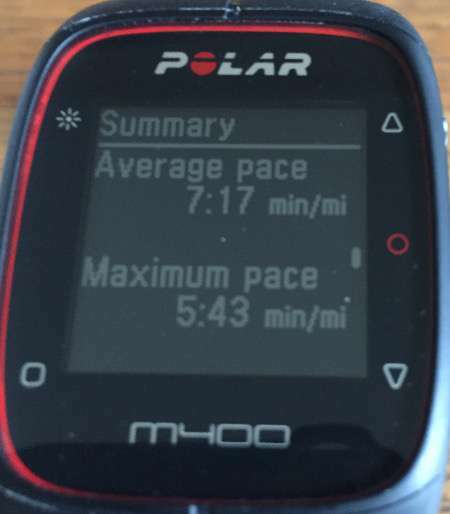 The Polar Flow is an amazing dashboard where I can track all of my personal results and progress towards my goals. 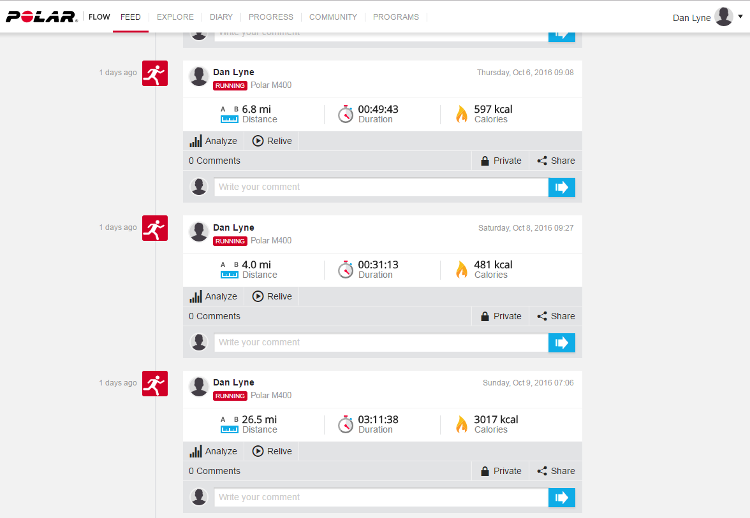 There’s also multiple tabs which can connect you to a vast Community of other Polar watch users around the world, a Program tab which can generates an individualized training plan for 5k, 10k, ½ and full marathons and the Feed tab which shows you details of all of your activities. The coolest feature on the Feed tab is the “relive” button. 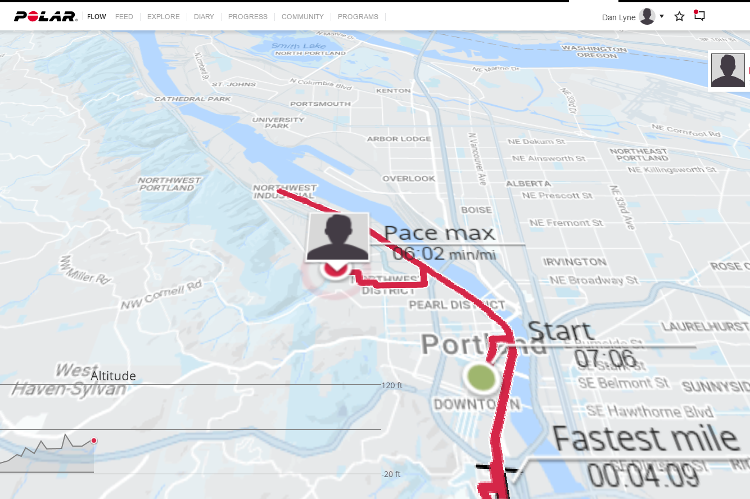 You can get a view of the sites of your workout and the times/pace of various intervals. 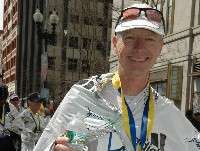 It literally helps you relive the experience of your run or race. I plan on reviewing the Polar Flow web service in much more detail in subsequent posts. For me, the M400 is a great tool to effectively track both my indoor and outdoor activities. I highly recommend this GPS enabled watch, the heart rate sensor and the Polar Flow website and iPhone app to not only track your training, but all daily activities. Workout Smarter & Track Your Progress with the Polar M400. Find Your New Training Partner Today. Free Shipping on orders $100+.Shop Now! 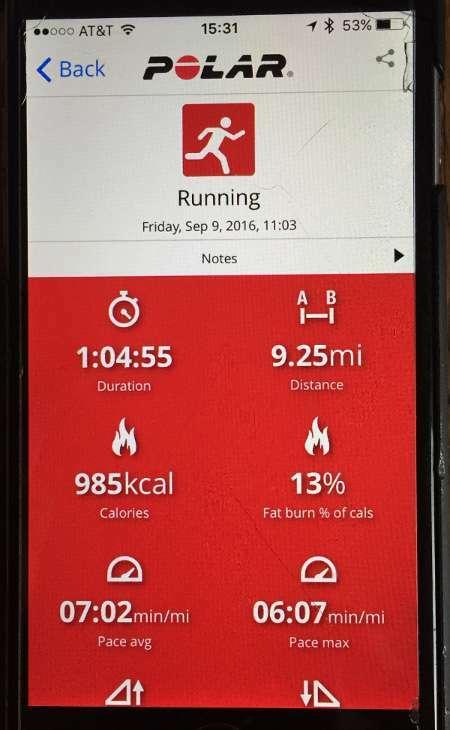 Large numbers on easy to read screen while you’re running. A little challenging to initially set up and sync with your iPhone. Just follow directions very carefully and it will work. Slow sync’ing if completed via Bluetooth to your mobile phone. Uncomfortable to wear at night (not really a huge deal for me because I’ve never worn a watch to bed).